The concept of civil disobedience, loosely defined as a non-violent uprising of citizens against a higher authority, first originated in the writings of Henry Thoreau in his essay Civil Disobedience. Refusal to abide by government-enforced rules that disfavor the interest and rights of citizens has served as an expression of the individual’s freedom of speech. The method is used in both democratic and undemocratic regimes; they are successful to varying degrees as they are deemed illegal in most countries. Historically, civil disobedience has led to societal changes when adopted by influential figures like Gandhi and Martin Luther King. The way these two individuals espoused this concept into their advocacy was influenced by their individual social context and environment. This article will outline the origins of civil disobedience as defined by Thoreau and demonstrate how this concept had been adopted by influential figures like Gandhi and Martin Luther King Jr. in order to strive to implement social change. Thoreau constructed the concept of civil disobedience in 1848. During that period, the US was both a slave-owning state and conducting a war against Mexico. The war in Mexico was highly controversial because it lost substantial amounts of territory. Abolitionists like Thoreau saw the war as merely a way to increase slavery in southern states, and therefore deemed it as unjust. Thoreau’s perception of the US as having unjust political institutions led him to question the legitimacy of the government. He resorted to the idea of civil disobedience as a nonviolent refusal to obey when authority is no longer legitimate. As a result, he decided to refrain from taking part in the government by refusing to pay his taxes. It resulted in his imprisonment. Afterwards, he was inspired to write Civil Disobedience in which he argues for individual’s duty to revolution as a means to fight injustice. He defends, “the right to refuse allegiance to, and to resist, the government, when its tyranny or its inefficiency are great and unendurable.” In essence, he believed by continuing to support the US government, citizens indirectly became perpetrators to this injustice, even by not directly partaking in the actions that made the government unjust and illegitimate. He states that “when the subject has refused allegiance, and the officer has resigned his office, then the revolution is accomplished.” His conception of civil disobedience advocates for the sheer lack of political activity in terms of democratic participation, and even extends to the right to break the law if it requires one to act unjustly. The refusal to cooperate would result in the resistance to such injustice. It is an individual’s responsibility to reflect on what is right or wrong and choose to take the correct path of action. This can be seen when he says that individuals are “not born to be forced” which implies that one’s choices should not be decided by the government. 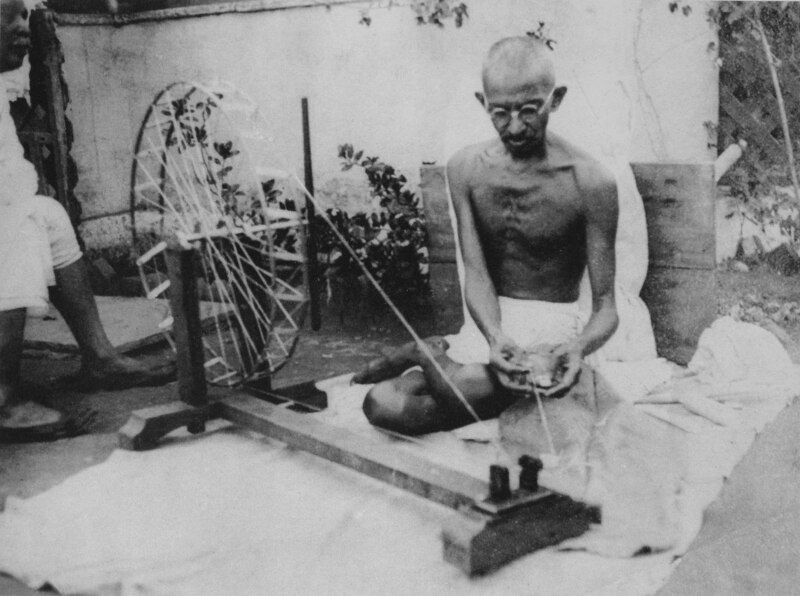 Photo of Gandhi spinning Charkha. This image is public domain, via Wikimedia Commons. Gandhi adopted the concept of civil disobedience when fighting for India’s independence from British colonial rule in 1930. His take on civil disobedience was implemented in his doctrine of Satyagraha, where he stated “civil disobedience, is undoubtedly an important branch [of satyagraha].” In his doctrine, Gandhi encourages individuals to focus on their spiritual self as it embodies their true power in terms of the individual’s expression of capacity to rise up against violence and maintain their dignity in the face of oppression. Civil disobedience is a crucial element of this doctrine, following a similar line of thinking to Thoreau’s, with the idea that this is rooted in the individual’s duty to rise against unjust laws for the greater good of society. Such civil resistance includes social boycott, public demonstrations, and peaceful protests. Gandhi’s most famous demonstration of civil disobedience was the Salt March in 1930. He urged villagers to march in order to protest the British imposition of tax on salt. The march resulted in the arrest of 100,000 people, yet was considered successful as a public demonstration of resistance and gained the support of the masses. It was amongst the first major demonstrations of resistance against colonial rule. A striking difference between Thoreau and Gandhi’s approach to civil disobedience revolves around the resulting punishment from such disobedience, which Thoreau fails to address as extensively as Gandhi. Like Thoreau, Gandhi was imprisoned for his public advocacy and his refusal to obey unjust laws. However, Gandhi believed that the acceptance of this punishment was a necessary element in carrying out the resistance. He saw it as a form of self-sacrifice one must make for the greater good in order to show their devotion to their cause. A similar approach to civil disobedience was adopted by Martin Luther King Jr. during the Civil Rights movements in the 1950s. 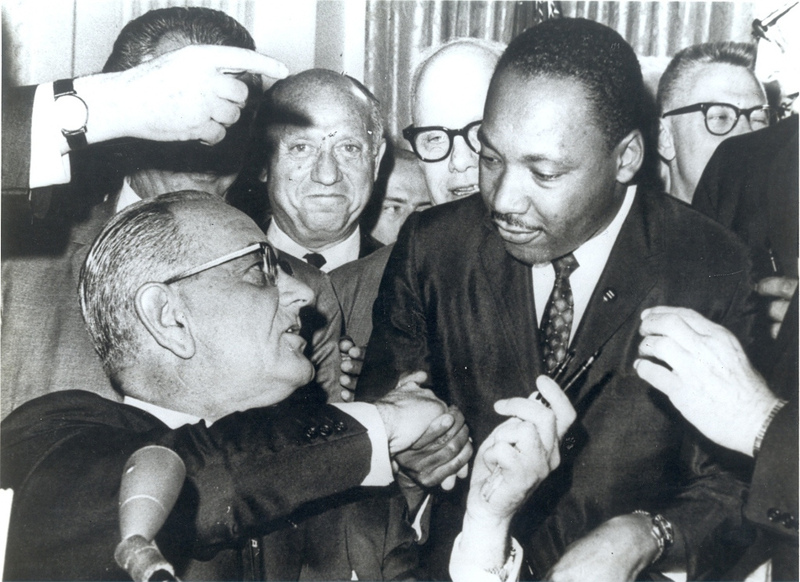 While King saw civil disobedience as the last resort after taking initial measures, he strongly believed that civil disobedience was the only effective method when trying to implement change. He argued that first, one must collect information to deduce whether the laws are unjust. He defines an unjust law as one that is contrary to morality, degrades human personality, or is imposed on a minority and not the majority. Therefore, the laws that were solely imposed on African-Americans or degraded them in any way were deemed unjust. After this identification, one should then strive to negotiate to change the law by demonstrating how they are unjust. However, he and Gandhi both shared the view that negotiations alone are often futile. Afterwards, one should turn to self-purification in a way to spiritually prepared for direct action in terms of civil disobedience. Another similarity between the two individuals is that they both believe that one should accept the punishment that results from civil disobedience. King posits that “one who breaks an unjust law must do so openly, lovingly, and with a willingness to accept the penalty.” Since civil disobedience entails breaking the laws, individuals should already have the willingness to face the resulting consequences of their action. Only then can citizens fight for their rights and freedom in the face of injustice. The three different approaches to civil disobedience differ due to the social context, yet a similar concept is apparent in the modern society as well. The conception of an acceptance for punishment as a necessary sacrifice has normative implications, yet also has a pragmatic dimension. In comparison to alternative means, such as a violent revolutionary war, it is more accessible to the masses than bearing arms. These methods manifest in many civil protests that try to implement radical change, and are used to achieve collective goals. The essence of civil disobedience depends on the individual’s perception of what is just and right, which may conflict what is considered lawful. Thoreau argues that “It is not desirable to cultivate a respect for the law, so much as for the right.” Like Thoreau, Gandhi and King advocated for the notion that the individual’s notion of right ought to be prioritized over the law.